Home>All Posts>Community Center>Working towards helping Sameer live a better life! The Community Health Projects endeavour is towards improving the health condition of communities in Mumbai. Prevention is another key focus area for the project is to identify disability among underprivileged community children. A survey in Jay Ambe Nagar, Govandi, identified Sameer Samim Khan – a 13 year old child blind in one eye due to a childhood injury. Our team visited the boy’s house to document a detailed case history of his ailment, family background and economic circumstances. 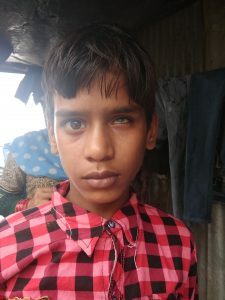 Unable to seek treatment during the time of injury, Sameer’s left eye became permanently blind. As working with children living with disability has been a priority for Mumbai Smiles, our team is in touch with the family through multiple follow up visits to ensure Sameer receives a disability certificate from the Government. The certificate will help him avail government schemes and services such as education, transportation, vocational training, access to healthcare, etc.